My first Hydrogen alpha image! Yay! Many people think that you cannot use a Ha filter with and unmodified DSLR, but my 12nm astronomik filter worked fantastically on my unmodded T3i. Very interesting FOV too, provided by my new Canon 200mm F/2.8L lens. Enjoy, HaRGB on the way (although the moon may delay me). At the focal point of the image, the Monkey head nebula (NGC 2174), an emission nebula in northern Orion, dominates the frame. 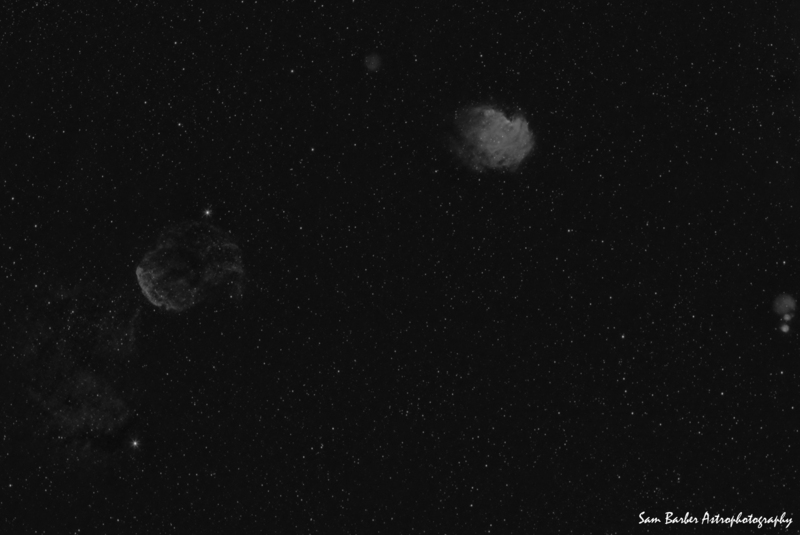 IC 443, also known as the Jellyfish nebula, is a supernova remnant. Just below it lies emission nebula Sh2-249. Above and to the left of the Monkey head is Sh2-247, and the small emission nebula to the lower right of the frame is IC 2162. 4hrs of 5min exposures, ISO 400, F/3.5, VERY light polluted area.